Vacu Vin Rapid Ice Wine and Champagne Bottle Coolers were developed to chill drinks quickly and keep it chilled for an extended period of time, all without the need of a refrigerator or ice bucket. The cooling sleeve contains 6 pockets of specifically formulated, non-toxic gel that expands when placed in a freezer for a period of 6 hours or more. Upon removal from the freezer, the Rapid Ice Bottle Cooler easily slides over the outside to chill the whole bottle within 5 minutes. Once cooled, the drink will remain chilled for hours due to the multiple layers of insulated foil and foam within the sleeve. 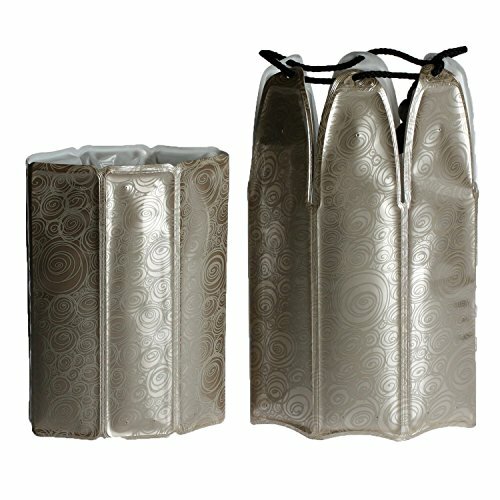 The Rapid Ice Bottle Cooler is designed to fit any standard-sized wine and champagne bottle. The award-winning bottle cooler is both flexible and virtually unbreakable. It is also lightweight which allows you to use it at parties, picnics, barbecues and much more! Once used, simply return the Rapid Ice Bottle Cooler to the freezer to reuse over and over again! Chills drinks within 5 minutes and keeps it cold for hours! No need for an ice bucket! Just place the Rapid Ice Coolers in the freezer for 6 hours to activite the cooling gel. When frozen, slide the cooler onto the bottle for perfectly chilled drinks in 5 minutes! Contains 1 Rapid Ice Wine cooler and 1 Rapid Ice Champagne Cooler.